Hey everyone, this is Gauge again. I thought I would take a couple minutes and show off my newly learned skill. 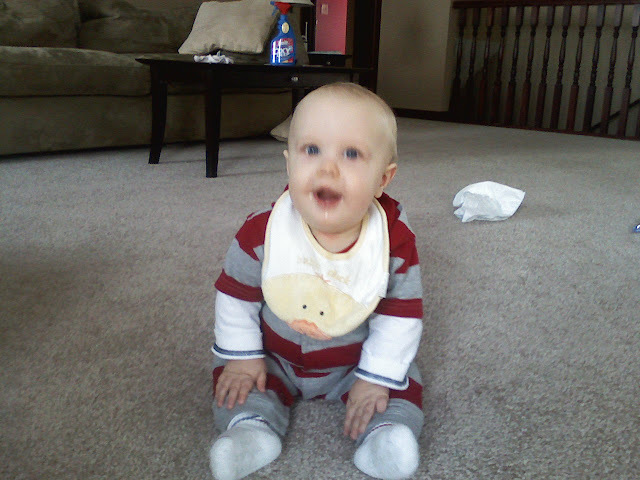 I can sit up now!!! This is so awesome, I watch everything that is going on around me. I especially love watching my doggy Nolah :) Sorry for the blurry picture...sometime I move too quick for mommy to catch me!! On Sunday night Uncle Nate, Aunt Sam, Mamaw, and Papaw came out for Uncle Nate's 32nd birthday. To the left is a picture of my big sis helping mommy make Uncle Nate's birthday cake. 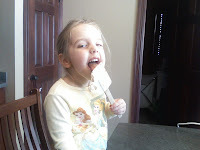 I wish I could have licked the spatula too. To the right you will see a link to my mommy's Relay for Life Walk. She walks in honor of my Uncle Nate. He is a cancer survivor. I love you Uncle Nate.